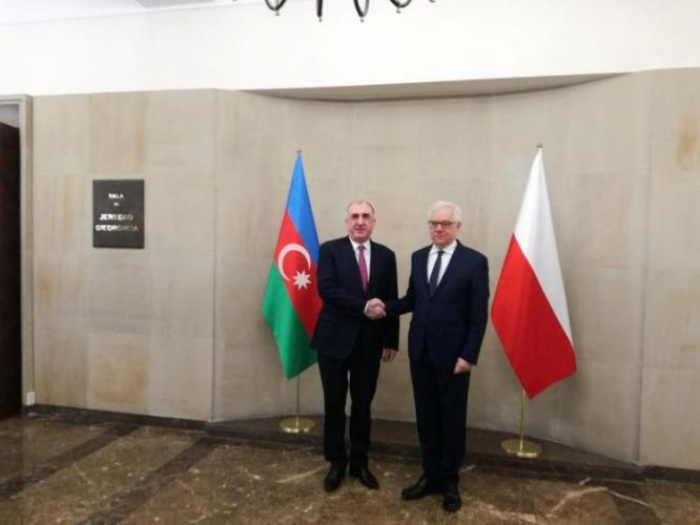 On the sidelines of his official visit to Poland, Azerbaijani Foreign Minister Elmar Mammadyarov met with Polish Foreign Minister Jacek Czaputowicz. After tête-à-tête discussions, the ministers continued discussions with the participation of delegations, the Azerbaijani Foreign Ministry told AzVision.az. First of all, speaking about the negotiation process on the settlement of the Armenia-Azerbaijan Nagorno-Karabakh conflict, Minister Mammadyarov noted the importance of resolving the conflict based on the principles of international law and the UN Security Council resolutions. Stressing the necessity of withdrawal of the Armenian armed forces from the occupied territories of Azerbaijan, Mammadyarov thanked Poland for its support for the territorial integrity and sovereignty of Azerbaijan. Furthermore, giving a brief information about the important energy and infrastructure projects implemented with the initiative and participation of Azerbaijan, he underlined the importance of the South Gas Corridor. Also speaking about the Trans-Caspian and South-West transport corridors, Minister Mammadyarov stressed that Azerbaijan cooperates with Poland in this field and is interested in enhancing the existing relations. Minister Jacek Czaputowicz highly appreciated the existing relations between the two countries. He underlined that Poland supports the cooperation of the European Union with the Eastern Partnership countries and emphasized his country's interest in developing energy cooperation with Azerbaijan. The ministers discussed the issues of exchanging mutual visits, increasing trade turnover and expanding the legal framework. Furthermore, the ministers held a joint press conference.